The four countries boycotting Qatar said they will maintain isolation of the gas-rich tiny Gulf state notwithstanding the agreement between Doha and Washington to fight terrorism funding. The US and Qatar Tuesday signed a Memorandum of Understanding (MoU) to dry up funding sources for terrorists. The signing, which occurred during the visit of US Secretary of State, Rex Tillerson, to Doha was described as a significant move towards the fight against terrorism by Qataris foreign minister Sheikh Mohammed bin Abdulrahman Al-Thani who also called boycotting countries to join. “Today, Qatar is the first country to sign a memorandum of agreement with the US, and we call on the countries imposing the siege against Qatar to join us as signatories to this MOU,” he said. The Qatari official added that the agreement was not related to the diplomatic row between Qatar and its neighbors. Tillerson praised Qatar for signing the deal, and for committing to the effort “to track down and disable terror financing”. “The US has one goal: To drive terrorism off the face of the earth,” Tillerson said. 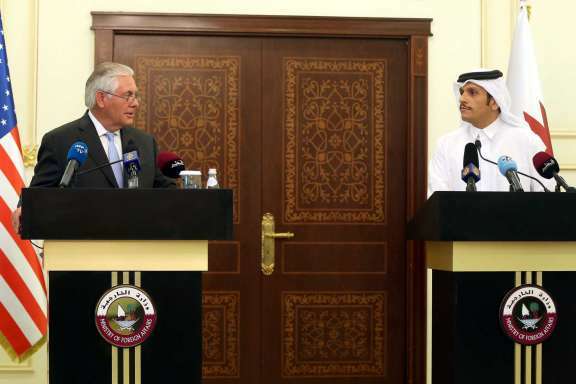 “Together, the United States and Qatar will do more to track down funding sources, will do more to collaborate and share information, and will do more to keep the region and our homeland safe,” the Secretary of State said. Saudi Arabia, United Arab Emirates (UAE), Bahrain and Egypt early last month severed ties with Qatar and brandished 13 conditions including cease to terrorism funding as demands to be fulfilled by Doha before normalization of ties. Qatar officially rejected the conditions, which they deemed ‘unrealistic’. The sea, air and land blockades will continue until Qatar “commits to the implementation of the just and full demands,” the bloc said. Last week, the quartet upon receiving Qatar’s response said the blockades could be there for a long time if Qatar does not change its attitude. After Doha, Tillerson is set to tour other gulf capitals as part of US mediation in the ongoing Gulf crisis. Written by: Jaber Ali on July 12, 2017. Posted by Jaber Ali on Jul 12 2017. Filed under Gulf News, Headlines. You can follow any responses to this entry through the RSS 2.0. Both comments and pings are currently closed.